Arsenal midfielder Emmanuel Frimpong has joined Premier League rivals Fulham on loan until the end of the season. 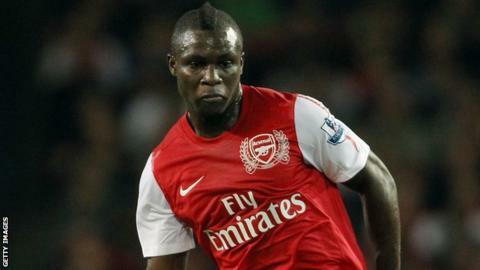 Frimpong, 21, recently returned to the Emirates from a six-week loan spell with Championship side Charlton. The Ghanaian, who was injured for seven months after tearing his cruciate ligament in February 2012, has played twice for Arsenal in 2012-13. He joined the Arsenal academy as an 11-year-old and played a key role in their 2009 FA Youth Cup victory. "Fulham FC is pleased to announce that Emmanuel Frimpong has joined the Whites on loan from Arsenal for the rest of the season," the west London club said on their official Twitter account.